Editing the same document at the same time by two editors is a key feature of an online IDE we’re currently working on. The application is built with Meteor. Which options are there to implement concurrent editing based on operational transformation? No design, just functional: Editing the same document at the same time finally works. Let’s take a look at the network tab! The Mongo collections created for this example. A docs table contains the content of all documents. For every document an ops table is created, just like ops.test in our test case. It contains the operational transformations. Setting the option opsCollectionPerDoc to false will create only one table ops for all documents. The great advantage of this solution is the easy integration. It took less than an hour to get this feature working in a basic way. The server API of ShareJS is available to access the documents on the server. I see the big disadvantage that this solutions creates something like a parallel universe to the Meteor data features, which already provide a real-time communication between client and server using websockets, which can be considered better for this type of communication. The browser opens a second connection to the same server, which needs twice the ports and thus more resources. The client does the diffing to generate the transformations. The transformations are collected by the server and written to a published collection (after adapting the transformation to the current state). The client subscribes to the collection and adopts the content of the editor accordingly (keeping in mind, that some transformations might not be processed by the server yet). This would lead to a pure Meteor OT implementation. 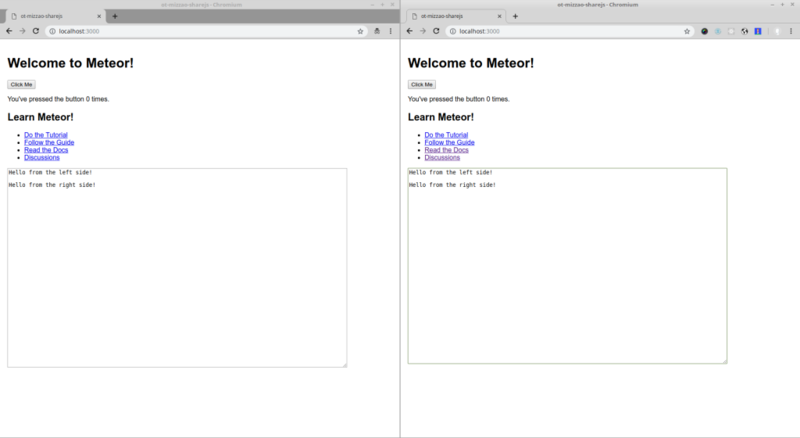 The websocket of Meteor is reused for the communication between ShareJS client and server. This would give all the possibilities and optimizations of ShareJS, which is a well-tested piece of software. There are no API changes, so existing applications based on edemaine:sharejs or mizzao:sharejs will continue to work without any changes. This project is supported by a netidee grant from the Internet Foundation Austria.